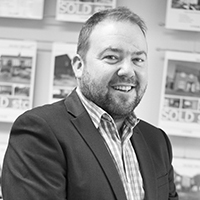 Tim has an extensive background in financial services and mortgages within the field of estate agency, spanning over 20 years. Previously head of the Mortgage Advice Bureau (MAB) franchise for Newton Fallowell, he is now the Managing Director of the Swadlincote branch and acts as the branch’s main valuer for both sales and lettings. Outside of work, Tim is a real music fan. When he’s not going to gigs and festivals, he can be found buying and enjoying music at home, especially vinyl. He also enjoys live comedy, football, travel and family time.